Fructose (or levulose) is a simple sugar (monosaccharide) with the same chemical formula as glucose (C6H12O6) but a different atomic arrangement. Along with glucose and galactose, fructose is one of the three most important blood sugars in animals. Sources of fructose include honey, fruits, and some root vegetables. Fructose is often found in combination with glucose as the disaccharide sucrose (table sugar), a readily transportable and mobilizable sugar that is stored in the cells of many plants, such as sugar beets and sugarcane. In animals, fructose may also be utilized as an energy source, and phosphate derivatives of fructose participate in carbohydrate metabolism. In addition to natural sources, fructose may be found in commercially produced high fructose corn syrup (HFCS). Like regular corn syrup, HFCS is derived from the hydrolysis of corn starch to yield glucose; however, further enzymatic processing occurs to increase the fructose content. Until recently, fructose has not been present in large amounts in the human diet; thus, the increasing consumption of HFCS as a sweetener in soft drinks and processed foods has been linked to concerns over the rise in obesity and type II diabetes in the United States. Fructose’s Glycemic Index (an expression of the relative ability of various carbohydrates to raise blood glucose level) is relatively low compared to other simple sugars. Thus, fructose may be recommended for persons with diabetes mellitus or hypoglycemia (low blood sugar), because intake does not trigger high levels of insulin secretion. This benefit is tempered by a concern that fructose may have an adverse effect on plasma lipid and uric acid levels, and that higher blood levels of fructose can be damaging to proteins. Fructose is a levorotatory monosaccharide (counterclockwise rotation of plane polarized light) with the same empirical formula as glucose but with a different structural arrangement of atoms (i.e., it is an isomer of glucose). Like glucose, fructose is a hexose (six-carbon) sugar, but it contains a keto group instead of an aldehyde group, making it a ketohexose. Like glucose, fructose can also exist in ring form. Its open-chain structure is able to cyclize (form a ring structure) because a ketone can react with an alcohol to form a hemiketal. Specifically, the C-2 keto group of a fructose molecule can react with its C-5 hydroxyl group to form an intramolecular hemiketal. Thus, although fructose is a hexose, it may form a five-membered ring called a furanose, which is the structure that predominates in solution. Fructose's specific conformation (or structure) is responsible for its unique physical and chemical properties relative to glucose. For example, although the perception of sweetness depends on a variety of factors, such as concentration, pH, temperature, and individual taste buds, fructose is estimated to be approximately 1.2-1.8 times sweeter than glucose. Fructose is absorbed more slowly than glucose and galactose, through a process of facilitated diffusion (in which transport across biological membranes is assisted by transport proteins). Large amounts of fructose may overload the absorption capacity of the small intestine, resulting in diarrhea. For example, young children who drink a lot of fruit juice that is composed mainly of fructose may suffer from “toddlers’ diarrhea.” Fructose is absorbed more successfully when ingested with glucose, either separately or as sucrose. Most dietary fructose is then metabolized by the liver, a control point for the circulation of blood sugar. Energy from carbohydrates is obtained by nearly all organisms via glycolysis. It is only the initial stage of carbohydrate catabolism for aerobic organisms such as humans. The end-products of glycolysis typically enter into the citric acid cycle and the electron transport chain for further oxidation, producing considerably more energy per glucose molecule. Fructose may enter the glycolytic pathway by two major routes: one predominant in liver, the other in adipose tissue (a specialized fat-storage tissue) and skeletal muscle. In the latter, the degradation of fructose closely resembles the catabolism of glucose: the enzyme hexokinase phosphorylates (adds a phosphate) to form fructose-6-phosphate, an intermediate of glycolysis. Fructose is phosphorylated by the enzyme fructokinase to fructose-1-phosphate. The six-carbon fructose is split into two three-carbon molecules, glyceraldehyde and dihydroxyacetone phosphate. Glyceraldehyde is then phosphorylated by another enzyme so that it too can enter the glycolytic pathway. Because the liver metabolizes fructose differently than glucose, its breakdown also has different biochemical and physiological effects. Fructose metabolism provides the liver with an abundance of pyruvate and lactate for further degradation, so that metabolites of the citric acid cycle, such as citrate and malate, also build up. Citrate can be converted to acetyl CoA, which serves as a precursor for fatty acid synthesis or cholesterol synthesis. Thus, a long-term increase in fructose or sucrose consumption can lead to increased plasma levels of triglyceride and lactate, as well as increased lipid storage in adipose tissue. Fructose intolerance (Hereditary Fructose Intolerance or HFI) is caused by an inherited deficiency of the enzyme Fructose-1-phosphate aldolase-B. The absence of this enzyme prevents the breakdown of fructose beyond its intermediate fructose-1-phosphate. The resulting accumulation of fructose-1-phosphate and depletion of phosphates for ATP production in the liver blocks both the synthesis of glucose (gluconeogenesis) and the release of glucose through the breakdown of glycogen (glycogenolysis). If fructose is ingested, vomiting and hypoglycemia will result; long-term effects include a decline in liver function and possible kidney failure. Fructosuria, in contrast, is caused by a genetic defect in the enzyme fructokinase. This benign disorder results in the excretion of fructose in the urine. Fructose malabsorption (Dietary Fructose Intolerance or DFI) stems from a deficiency of a fructose transporter enzyme in the enterocytes (specialized cells found on the surface of the intestines). In fructose malabsorption, the small intestine fails to absorb fructose properly. In the large intestine, the unabsorbed fructose is metabolized by normal colonic bacteria to short-chain fatty acids and the gases hydrogen, carbon dioxide, and methane, which leads to symptoms of abdominal bloating, diarrhea, or constipation. Foods with high glucose content help sufferers to absorb fructose. The production process of high fructose corn syrup (HFCS) was developed by Japanese researchers in the 1970s. HFCS was rapidly introduced in many processed foods and soft drinks in the United States over the period 1975–1985, and usage continues to increase (Bray et al. 2004). The preference for fructose over glucose or sucrose in U.S. commercial food production can be explained in part by its cheaper cost, due to corn subsidies and import sugar tariffs. In addition, fructose does not form crystals at acid pH and has better freezing properties than sucrose, which leads to easier transport and a longer shelf life for food products. Common commercial grades of high fructose corn syrup include fructose contents of 42 percent, 55 percent, or 90 percent. The 55 percent grade is most commonly used in soft drinks and is equivalent to caster sugar. One study concluded that fructose "produced significantly higher fasting plasma triacylglycerol values than did the glucose diet in men" and "if plasma triacylglycerols are a risk factor for cardiovascular disease, then diets high in fructose may be undesirable" (Bantle et al. 2000). A study in mice suggests that fructose increases adiposity (amount of body fat or adipose tissue) (Jurgens et al. 2005). However, these studies looked at the effects of fructose alone. 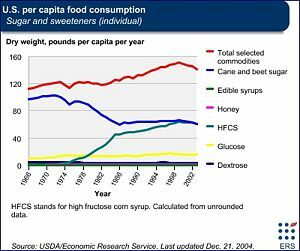 As noted by the U.S. Food and Drug Administration (FDA) in 1996, the saccharide composition (glucose to fructose ratio) of HFCS is approximately the same as that of honey, invert sugar, and the disaccharide sucrose. A more recent study found a link exists between obesity and high HFCS consumption, especially from soft drinks (Bray et al. 2004). While the over-consumption of HFCS may be a contributor to the epidemic of obesity and Type II diabetes in the United States, the obesity epidemic has many contributing factors. University of California, Davis nutrition researcher Peter Havel has pointed out that while there are likely differences between sweeteners, "the increased consumption of fat, the increased consumption of all sugars, and inactivity are all to blame for the obesity epidemic" (Warner 2006). Bantle, J., S. K. Raatz, W. Thomas, and A. Georgopoulos. 2000. “Effects of dietary fructose on plasma lipids in healthy subjects.” American Journal of Clinical Nutrition 72 (5): 1128-1134. Bray, G. A., S. J. Nielsen, and B. M. Popkin. 2004. “Consumption of high-fructose corn syrup in beverages may play a role in the epidemic of obesity.” American Journal of Clinical Nutrition 79 (4): 537-543. Dennison, B. 1997. “Excess fruit juice consumption by preschool-aged children is associated with short stature and obesity.” Pediatrics 99 (1): 15-22. Havel, P. J. 2005. “Dietary fructose: Implications for dysregulation of energy homeostasis and lipid/carbohydrate metabolism.” Nutrition Review 63 (5): 133-157. Jurgens, H. et al. 2005. “Consuming fructose-sweetened beverages increases body adiposity in mice.” Obesity Research 13: 1146-1156. Levi, B., and M. J. Werman. 1998. “Long-term fructose consumption accelerates glycation and several age-related variables in male rats.” Journal of Nutrition 128: 1442-1449. McPherson, J. D, B. H. Shilton, and D. J. Walton. 1988. “Role of fructose in glycation and cross-linking of proteins.” Biochemistry 27: 1901-1907. Warner, M. 2006. “A sweetener with a bad rap.” New York Times July 2, 2006. Wylie-Rosett, J. et al. 2004. “Carbohydrates and increases in obesity: Does the type of carbohydrate make a difference?” Obesity Research 12: 124S-129S. This page was last modified on 30 October 2012, at 23:37.